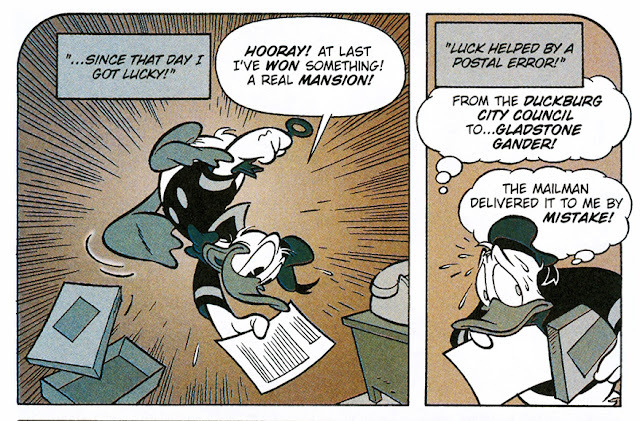 IDW just published the two-part story The Diabolical Duck Avenger in Donald Duck #5 and #6 (legacy 372 and 373). This story, originally published in 1969 in Italy, tells the story about how Donald Duck finds Fantomallard’s diary and becomes the Duck Avenger. I’m a bit surprised it took 46 years to get this story published in the USA, in Europe the story is quite famous! The San-Diego comic-con magazine "Disney Comics – 75 Years of Innovation" (2005) even have a page telling that this story is an important milestone in the history of Disney comics. For me this story is a bit nostalgic. 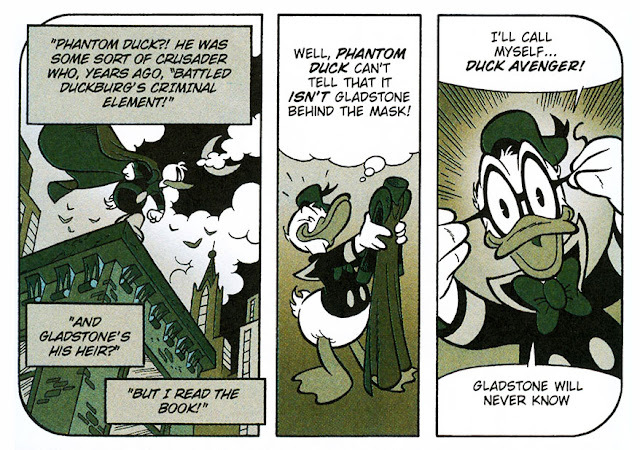 The origin story is also the first story with the Duck Avenger I ever read. My local library had this story in one of the oversized books similar to the American Abbeville books. And I remember I loved the story as a kid and borrowed the book numerous times. So I really enjoyed re-reading the story with American dialogue! The Norwegian book "Jeg Super-Donald"
I’m not going to do a review of the story itself, I’m sure some other bloggers will do that. 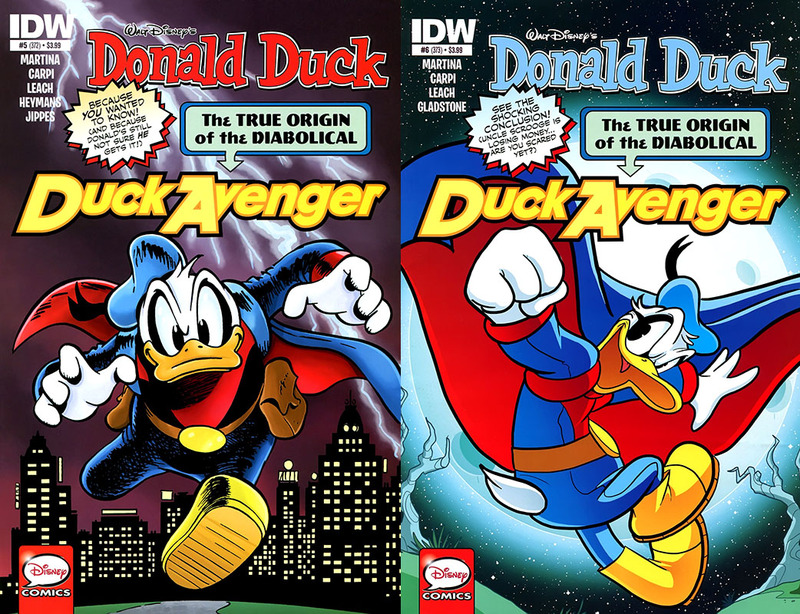 But did you notice the cover made a point out of this being the true origin of the Duck Avenger? 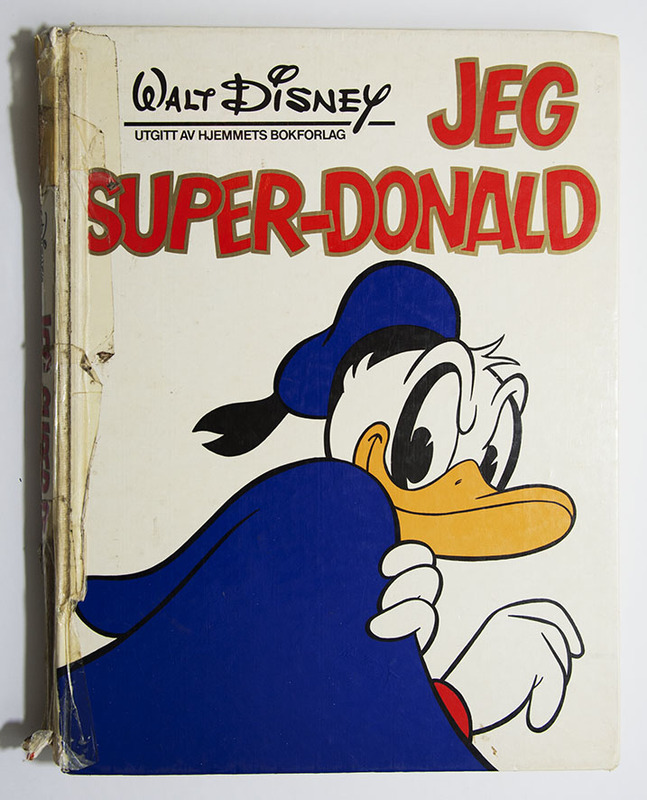 Because the story is actually not the first origin story printed in English. 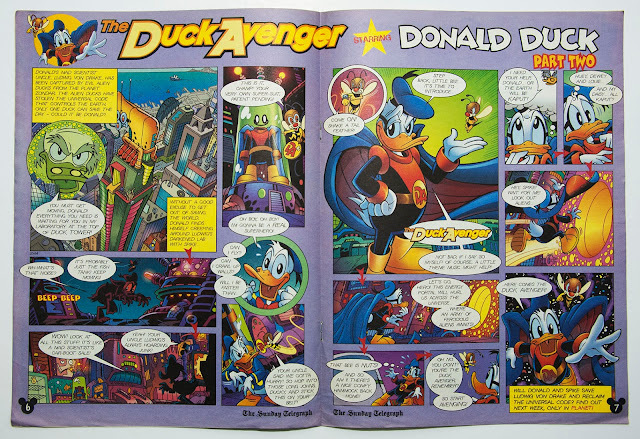 The first one was The Secret Origin of the Duck Avenger in the May 2000 issue of Disney Adventures, and with a follow up part in the next issue . 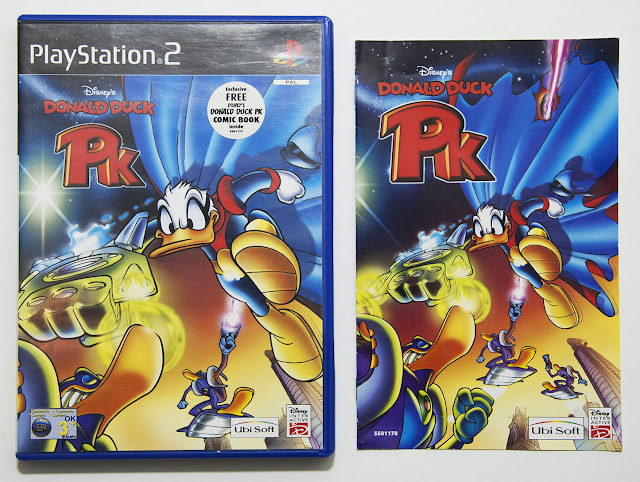 In this origin story the "mad scientist Ludwig von Drake" has been captured by evil alien ducks from the planet Zondar, and needs Donald’s help. 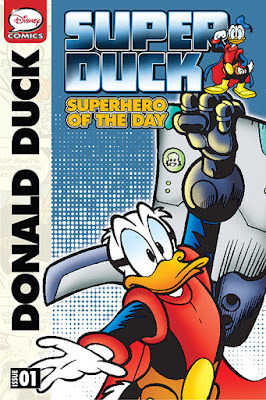 In Ludwig’s laboratory Donald find a super-suit and the Duck Avenger is born! 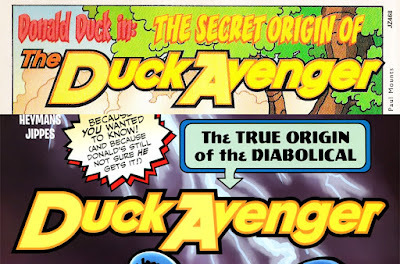 The logo used in this story is the same as IDW now use for the Duck Avenger, and I can’t remember seeing it anywhere else. So that’s probably the source for IDW’s logo. 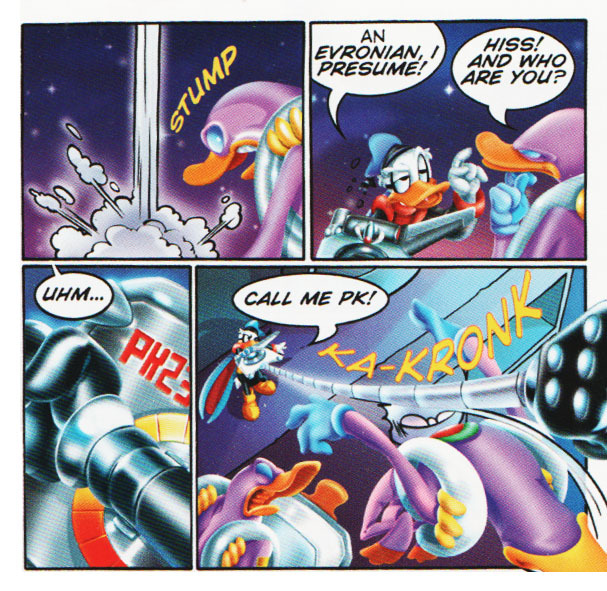 When the Evronians invade the planet, Donald gets recruited in a hurry to be a "Guardian of the Galaxy". ..and a redressing, he is ready for action! 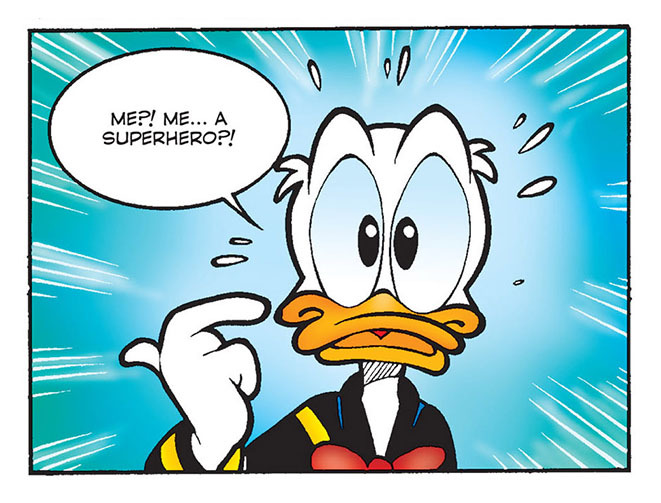 But in this translation as Superduck. This story is actually a reboot of the PK series. Like every proper superhero series, of course we have a reboot… A similar story introduced the original PK series, but in that story Donald already is the Duck Avenger when he discovers Uno in the tower and starts fighting aliens. So it’s more true to the Duck Avenger canon. I don’t think the original PK introduction is translated to English. 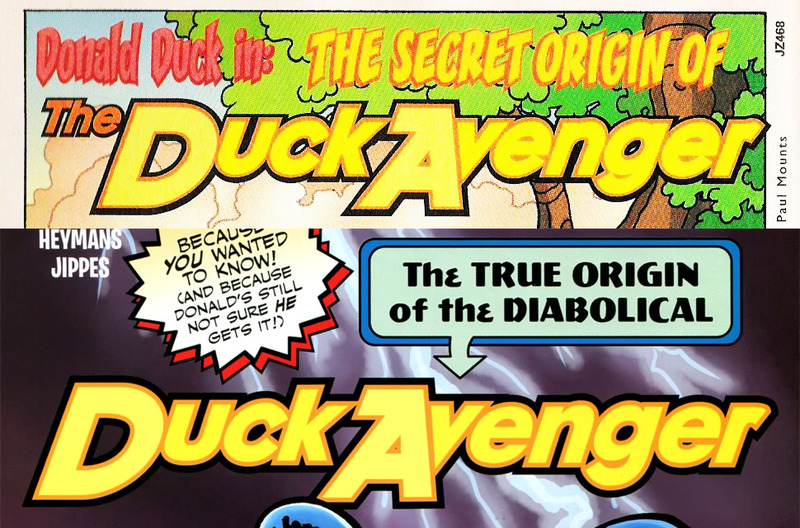 So we have 3 different origin stories for the Duck Avenger, that should be enough right? Well, there’s actually a 4th in the video game PK: Out of the Shadows! 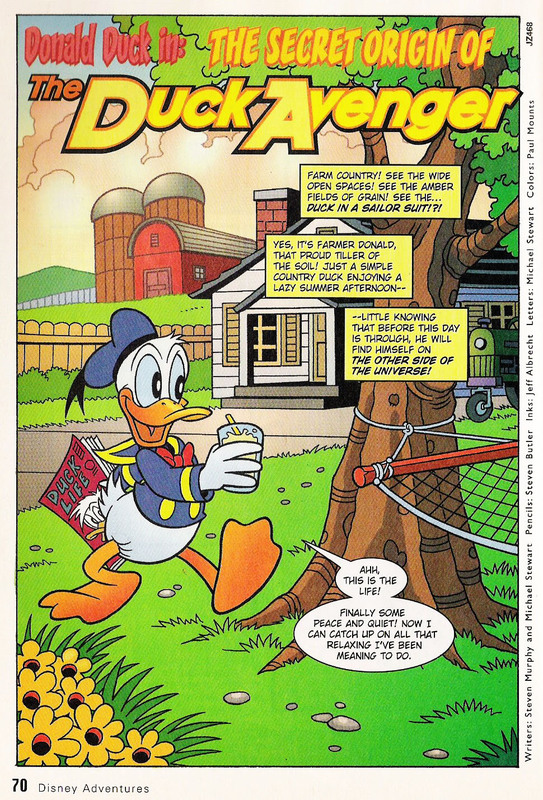 And the PAL version of the game (both the GameCube and PlayStation 2 versions) comes with a comic insert telling this story. The story is called Evron Attacks and is pretty much just a short and slightly rewritten version of the "Superhero of the Day" story. In this story the Duck Avenger is called PK. Gemstone only published two stories with the Duck Avenger. The first one, Crisis (Donald Duck Adventures #14), is not that interesting. 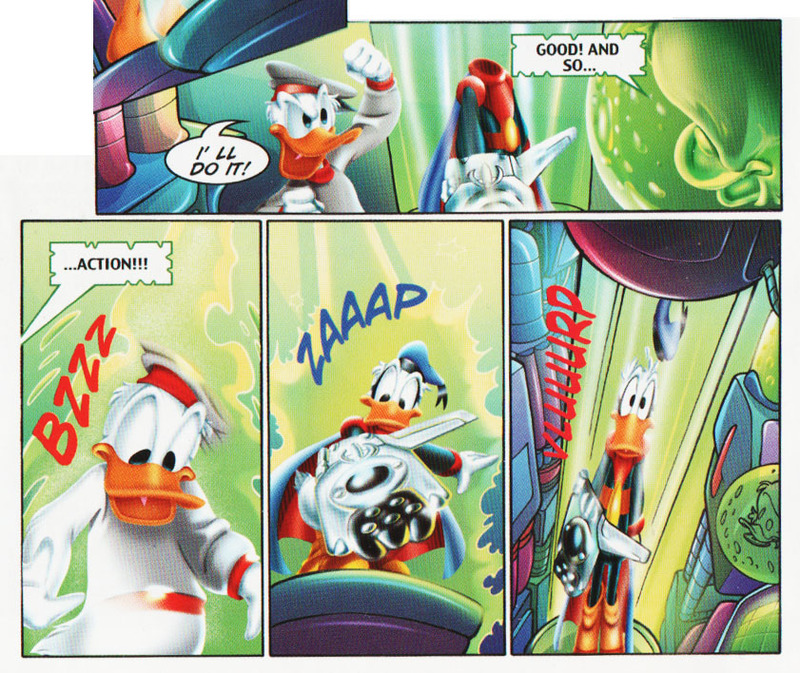 It’s just a typical Italian Duck Avenger story with nothing special in it. But the next one was the closet we had to a (translated) true origin story before IDW finally printed it. The story Legacy (Donald Duck Adventures #18) has a lot of references to “The Diabolical Duck Avenger”, and tells the origin story through flashback scenes. In this translation the predecessor is called Phantom Duck, and not Fantomallard like in the recent IDW translation of the origin story. "Legacy" is (kind-of) a sequel and extension to both "The Diabolical Duck Avenger" and the story "Paperinik alla riscossa" which gives more details about the Duck Avenger’s predecessor. I really hope that story is going to be translated and published by IDW too! And to get more insight into the backstory, they should also translate "Paperinik e il tesoro di Dolly Paprika". During the BOOM! 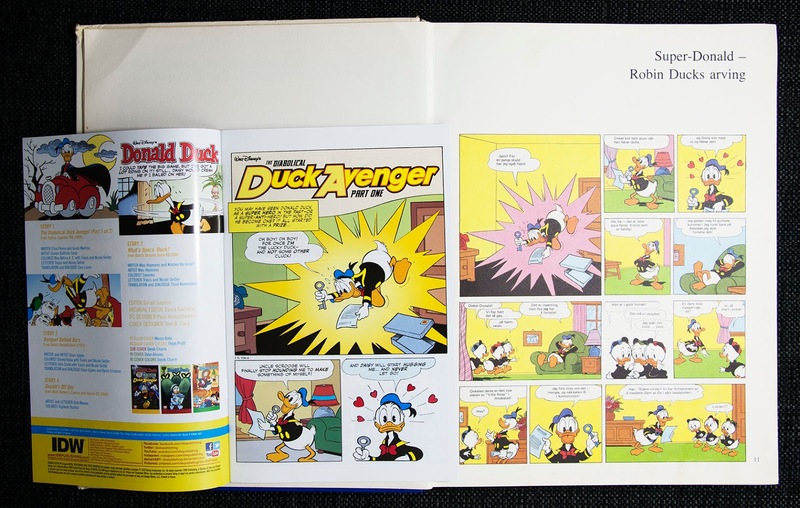 run of Disney comics we saw another version of the Duck Avenger. 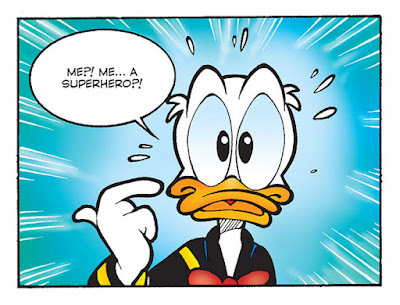 Eega Beeva assembles all Duckburg superheroes to form the group Ultraheroes. 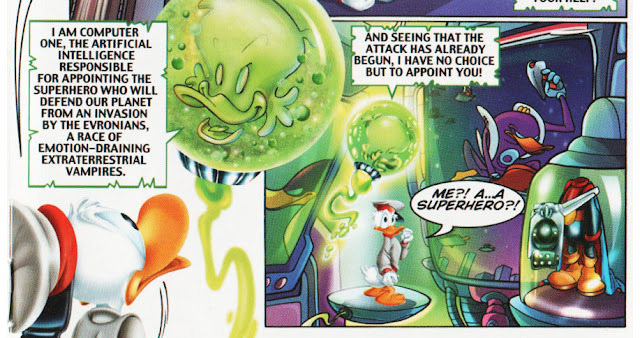 Of course, the Duck Avenger is part of that group, but he used another suit when appearing as part of the Ultraheroes. 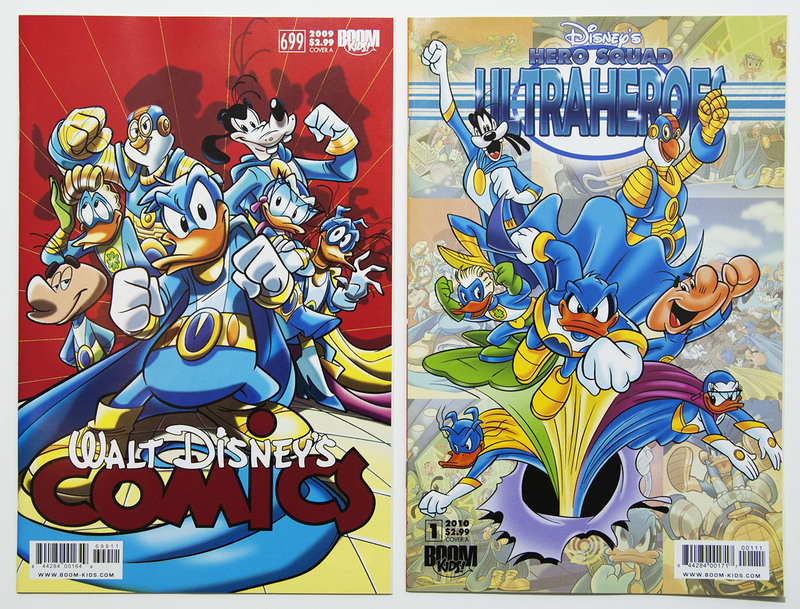 The Ultraheroes story started in Walt Disney's Comics and Stories #699, but from part 5 on it continued in its own title. The entire story was later collected in 3 trade paperbacks. Thanks. I’m not sure that many people know about and follow the blog yet, so I’ll just keep it going. I hope too that you continue! Keep up the good work! Ooph, I really dislike the recoloured versions in UltraHeroes. 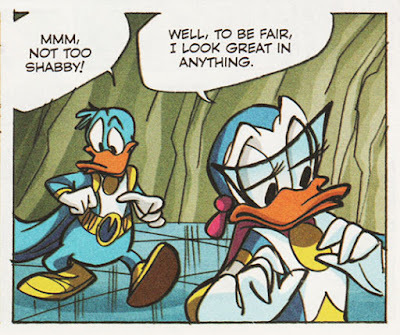 Everyone looks worse other than Super Goof, and the whole point was that Super Goof looked silly! 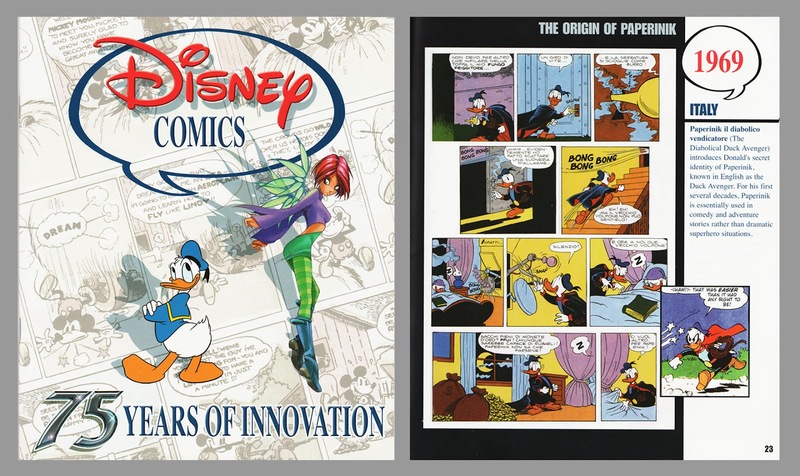 Good job man!Greetings from Greece!It is the birthplace of the best Disney publications in the whole world!I love the Duck Avenger in English but only designed by the classic Italian artists!Keep up the good work!